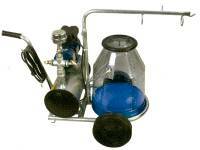 Portable Milkers and Milking Machines We sell portable milkers and bucket units for use anywhere. You can milk your house cow or sick cows very easily. 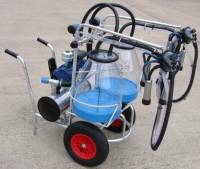 These portable milking machines simply are the best you can buy. You will not find a better machine anywhere. In use throughout the UK, with many satisfied customers. This package includes everything you need to milk a single cow. This package includes everything you need to milk a twin cow. This package includes everything you need to milk a single goat. This package includes everything you need to milk two goats. This package includes everything you need to milk a single sheep. This package includes everything you need to milk two sheep. milkingmachines.co.uk © Copyright 1999 - 2018. Web design and SEO by Shaun Wheeler. This site was last updated 12/09/2018, and features in isleofwightweather.co.uk. loheat.co.uk sell dairy equipment and water heaters. milk-bar and calf-feeding.co.uk sell calf feeders. Part of the dc engineering specialist dairy engineers and milking machine installers collection of milking machine and dairy equipment websites, helping provide you with usable milking solutions.